Not to be confused with World 2-6, Level 2-6, or Stage 2-6. Area 2-6 is the sixth course of Jumpy Jungle and the fifteenth course overall in Mario vs. Donkey Kong: Mini-Land Mayhem!. 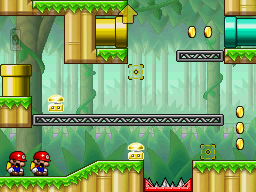 The Mini Marios begin on a platform over to the bottom left, with the exit door at the top right. In order to reach it, the Mini Marios must use the Long Springs and Warp Pipes and make their way to the door. The M-Token is located on the top left, atop a platform. To collect it, the Mini Marios must simply drop down from the vertical cyan Warp Pipe entrance and bounce on two consecutive Long Springs to the collectible. The Mini Mario Card is located at the bottom center, just above the vertical yellow Warp Pipe entrance. The Mini Marios must simply use the beginning Long Springs to reach it. In Plus Mode, the Mini Toad must be guided to the exit door first, followed by the Mini Peach.